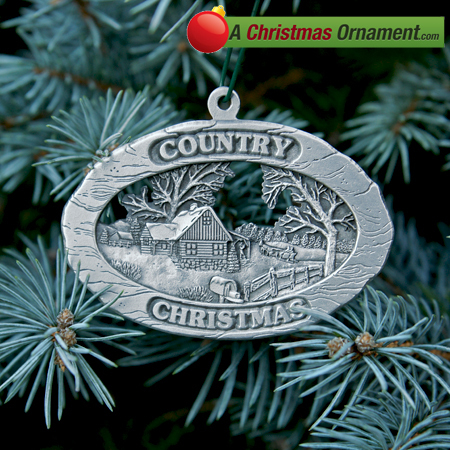 Christmas Ornaments Made in USA - Pewter Country Christmas Ornament - A Christmas Ornament Co.
Pewter casted in what looks to be an engraved piece of wood, this beautiful rural scene is essential to every family household celebrating a Country Christmas. A joyous couple is traveling on a horse-drawn sleigh ride as they pass by a neighbor's log cabin house in search for a beautiful, snow covered country side tour. With the gorgeous landscape ahead of them, they are along for a great journey with spectacular scenery. What better way to spend the holidays with your loved ones in the winter wonderland of the American country side. This ornament measures 2.625''x2.25" and is Made in the U.S.A.